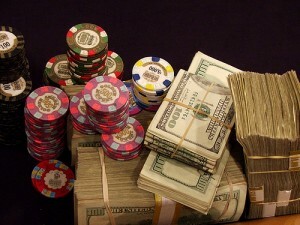 Many people ask me as a full time player/writer and coach what the toughest aspect is about playing no limit hold’em? It is in actual fact the potential to put your stack at risk in any one individual hand and while everyone knows this, what they may not be aware of are the mechanics of just why this is the case. This will be the first part of a three part series explaining just why no limit hold’em cash games are just too tough to crack for many players. Firstly you have the capacity to play very deep whereas in tournament poker then you are rarely playing all that deep unless you reach the final stages. However in a cash game then you can immediately buy in for 100bb and if you amass money at the beginning then your stack could soon be several hundred big blinds deep. The size of the mistake that you can make are commensurate with the size of the stack that you have. This means that if you play the post flop part of the game badly then your mistakes will be bigger sitting on a 150bb stack than if you were sitting with a 40bb stack. When you play deep then no limit hold’em becomes a whole new ball game! But one factor that few players take on board is that unlike in limit hold’em, you are constantly taking and laying odds in no limit play. This form of poker requires you to have an intimate knowledge of gambling odds and probabilities and if you are weak in that area then no limit play will find you out and expose you. Let us look at an example here to show you what I mean. You decide to steal raise from the button with 100bb at NL100 meaning that the stakes are $0.50-$1.00. You make it $3.50 and the big blind calls you. This puts $7.50 in the pot which is really around $7 after the rake. So you were risking $3.50 to make $1.50. If the big blind checks and you make a c-bet of around $5 then you will likely take the pot down quite often. But then again you need to because at this stage of proceedings then you have placed $8.50 into the pot and there is only $3.50 of that money which isn’t yours. These are hardly good odds to be taking and you have to win this pot with a very high frequency to justify the risk. Players get this part of the game wrong because they bet and raise for the wrong reasons and I will explain this in part 2. Carl “The Dean” Sampson plays poker at www.pokerstars.co.uk.